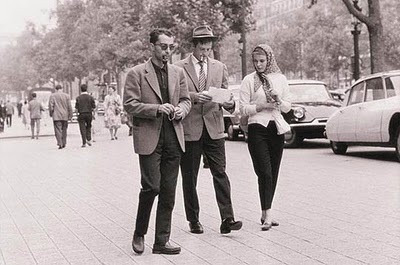 Two in the Wave is a documentary about a pair of filmmakers whose vibrant, groundbreaking work defined the French Nouvelle Vague, but I wish it shared some of their imagination and style. Emmanuel Laurent's film charts the relationship between François Truffaut and Jean-Luc Godard, two film critics turned film directors, whose shared cinephilia and adventurous spirit saw them forge a close bond in the early years of their career, as they shook up the cinematic establishment. Little in Two in the Wave will shake up the viewer, however. Laurent uses archive footage, interview excerpts and newspaper clippings to tell his story in an efficient but disappointingly flat manner, and his only stylistic flourish – employing a bored-looking Isild Le Besco to flick through magazines or wander around their old haunts – feels like a pointless affectation. The film holds the interest simply because the story of Godard and Truffaut is a fascinating one, and to be fair to Laurent, he does serve up some enlightening nuggets. There's an interesting sequence that details the filmmakers' influences, revealing that they learned how to shoot female faces by watching Bergman's Summer with Monika, and another fun scene shows some members of the French public reacting, often adversely, to the first showing of Godard's À bout de soufflé. The film also has a strong final section, which focuses on Jean-Pierre Léaud and depicts him as the rather bemused child torn between two squabbling fathers. Moments like that can't really turn Two in the Wave into anything more than a mildly intriguing curio for film buffs, however, and its failings can be summed up by one observation – soon after the film's start, I anticipated that it would end with the final shot of Truffaut's The 400 Blows, and I was disappointed to be proved right. Such predictability hardly seems fitting for a study of two directors who always sought to surprise their audiences.